If you�re looking to add some lift to your vehicle in order to fit some aftermarket tires and wheels, or just level it out, then you should consider the fine products from Ready Lift. When you choose a Ready Lift suspension leveling kit or lift kit from New Level Motor Sports, you�ll be able to maintain your factory ride quality while getting that extra boost you want. Ready Lift has been an industry leading developer and manufacturer of torsion bar keys, strut extenders, rear block kits, and lift kits. 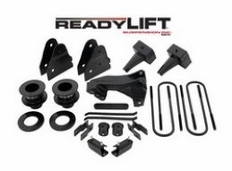 When you�re ready to level or lift your truck or SUV, we have the ReadyLift Lift kits you need to get the job done. Here at New Level Motor Sports, we�re an authorized dealer of Ready Lift gear, and that�s why we can offer you the Ready Lift lifetime guarantee. Don�t settle for anything less than the best. We guarantee the lowest price on Ready Lift suspension leveling kits and lift kits. If you see it lower somewhere else, we�ll match or beat that price!